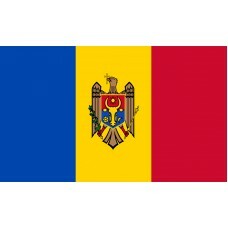 The Moldova Flag features three vertical bands in the colors of blue, yellow, and red. In the middle of the yellow band, is the Moldova Coat of Arms which is an illustration of an eagle with a cross in its beak, holding an olive branch in its right talons (a symbol of peace) and a scepter in its left talons. The Moldova flag is exactly the same as the Romanian flag, except for the Coat of Arms in the middle and the same colors were used as the Romanian flag to represent the shared heritage and the fact that Moldova used to be part of Romania. 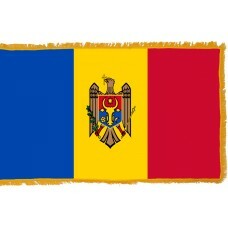 The Moldova Flag was adopted on May 20th, 1990. Both the Moldovan and Romanian Flag were derived from the French tricolor. The Moldova flag is one of the three national flags in the world to not have the same design on both sides. The reverse side of the Moldova flag just has the three vertical bands, without the Coat of Arms. Moldova is a landlocked country located in Eastern Europe that shares borders with Ukraine and Romania. The capital city of Moldova is called Chisinau. During the Soviet Era, the capital city had to be rebuilt, due to an earthquake that destroyed the majority of the city and due to the bombing during WWII. Moldova is thought to be one of the smallest countries in Eastern Europe, despite being home to one of the largest villages in Europe, Congaz, and is also one of the poorest. It is a country that has been ruled by many different Empires and countries throughout the years and one of the countries that hardly has any buildings or monuments to show for its history as the majority were destroyed. Now, Moldova is home to only 30 monasteries and wood churches. Moldova was part of the Greek, Roman, and Ottoman Empires. It was part of the "Principality of Moldovia." In 1812, it became part of the Russian Empire and was known as Bessarabia. In 1856, Southern Bessarabia returned to the Principality of Moldovia and three years later joined with Wallachia and formed Romania, which was under Russian rule from 1878. During the Russian Revolution, the MoldovianDemocratic Republic became independent but was joined with Romania, again, in 1918 until the breakdown of the Soviet Union when Moldova was finally able to declare independence on August 27th, 1991. Moldova is one of the least visited countries in Europe, despite having some lovely tourist attractions such as, the "Emil Racovita" cave, which is the 8th largest cave in the world as well as the largest building in the world that is in the shape of a bottle – "Strong Drinks Museum," located in Tirnauka Village. Moldova is also home to the largest underground wine cellar, which is in the Guinness Book Of Records and currently holds 1.5 million bottles of wine as well as the largest cave monastery.